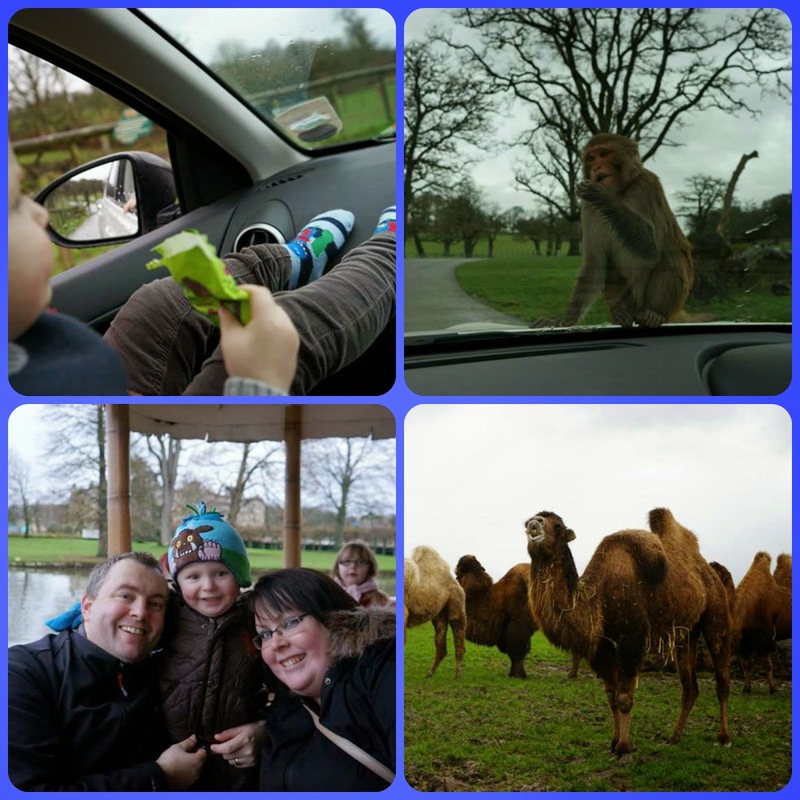 Ever since we visited Longleat Safari Park back in September (you can read about it here) , Elliot hasn't stopped talking about it. He's always telling people "we went to Longleat!" 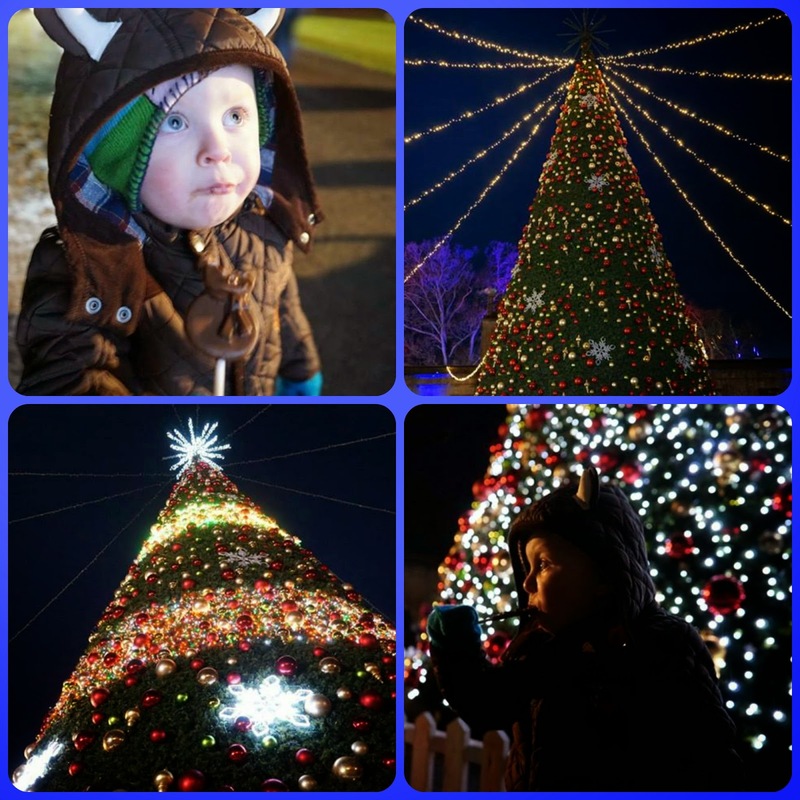 so I thought it would be great to visit again at Christmas time so we could see the Festival of Lights event that is running up until the 4th January 2015. The Festival of Lights is a spectacular display of giant Chinese lanterns. We didn't use our Tesco vouchers this time so paid full price (£23.35 per adult which included an online discount because we pre-booked) and fortunately Elliot was free as he isn't 3 yet. We also pre-booked a visit to see Father Christmas in his grotto - at £10 we didn't think this was too bad compared to other places I have seen advertised. But more on that later....! If you read my previous blog post about Longleat you'll know that Elliot fell asleep on the safari bus and missed all the big cats! Well we wanted to ensure he got to see them this time so we decided to take our own car around the safari - including the monkey bit eeeeek! We arrived at 11am and did the safari first so that Elliot was nice and awake - he loved sitting up front with me in the car and he was fascinated by the monkies jumping on the roof! He wasn't quite so taken with the camel who got a bit close to our open window - quick!!! Wind that window up!!! The Safari park was very busy compared with when we visited in the Summer but the only slow bit was going through the big cat enclosures - but that wasn't a problem, it gave us more time to see them. I have to say at this point that we had our Lion King soundtrack on repeat in the car (Elliot's request!) and it did make me giggle seeing all the lions and then us singing along to Circle of Life! I won't talk too much about the rest of the park because it was covered in my previous post but we actually saw the hippos this time! Yay! Now for The Festival of Lights....WOW!!!!!! Seeing the pictures on the website and actually seeing them in person is another thing - I was blown away. The lights were switched on at 4.30pm just as it was getting dark and it was amazing and so festive. Speaking of festive, we had a date with an important man at 4.30pm so we made our way over to the Grotto area and waited for an Elf to see us. 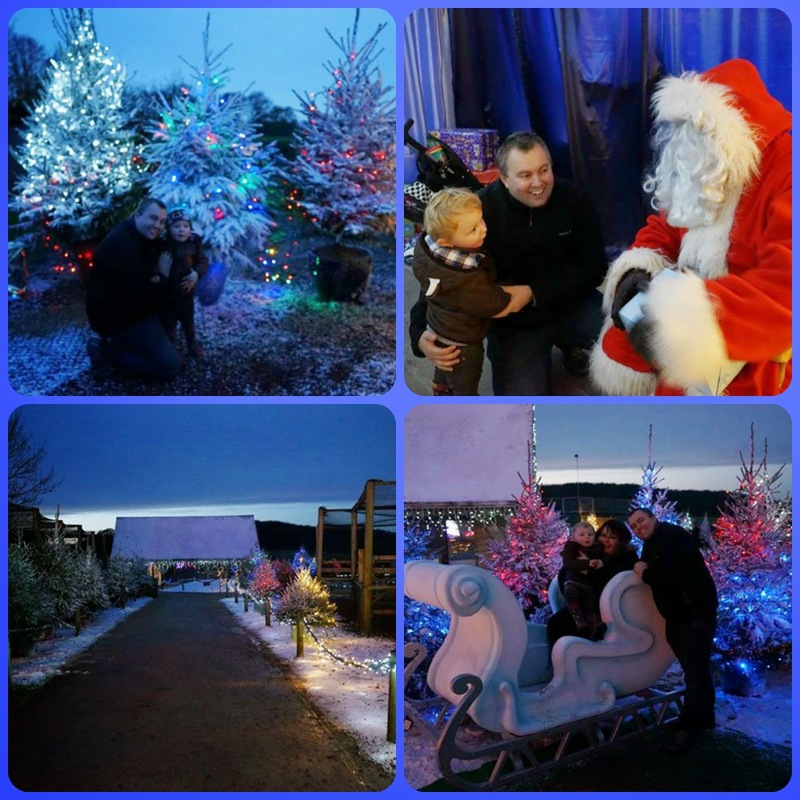 The lead up to the Grotto was absolutely lovely - lots of twinkly lights, Christmas trees, fake snow and even a donkey or two! It looked so Christmassy and it helped that it was really cold, I felt very festive! The Santa visits were done in half hour booking slots and we were first in line for our slot so didn't have to queue, we were whisked straight in to see Father Christmas. Elliot was a little bit shy but soon stepped forward when he saw Father Christmas holding out a present for him!! Although there was a queue behind us outside, we didn't feel rushed and the Elf let us take as many photos as we wanted. 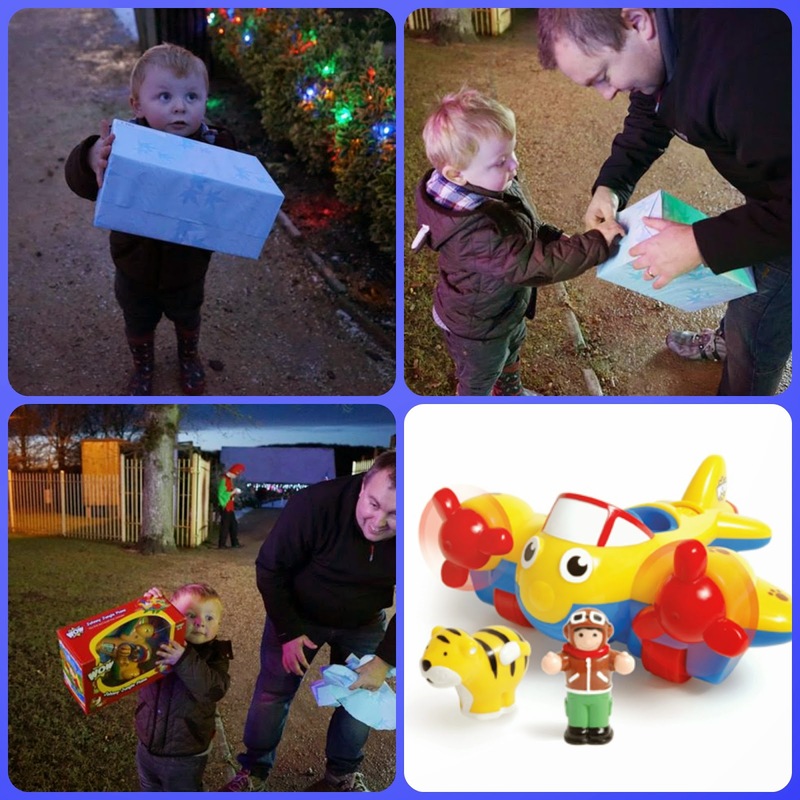 Once outside Elliot couldn't wait to open his present and he was very excited to see what was inside! It was a Johnny Jungle plane made by Wow toys - what a great gift! Perfect for a 2 yr old boy and he loved it. After leaving the Grotto we headed towards the main area and marvelled at all the light displays. 1000s of lanterns make up the display and it is the first of it's kind in Europe! We also found a 50ft singing Christmas tree which Elliot loved. It did shows every half an hour and we managed to catch one - it lit up, it glistened, it sang carols - Elliot was spellbound! We walked on through the rest of the display and it just got more impressive! 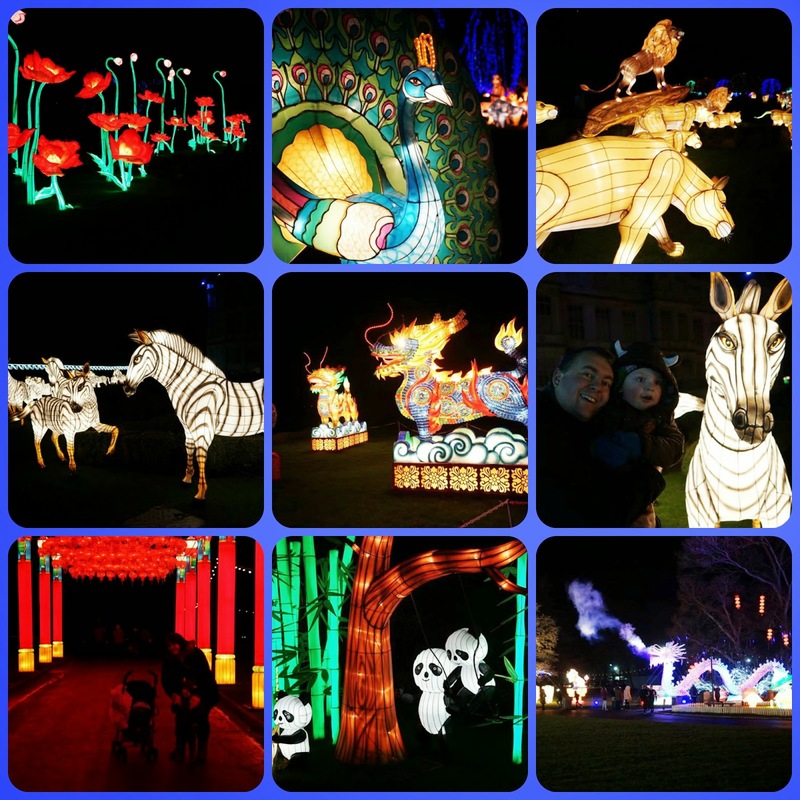 There were giant flowers, a menagerie of animals, dragons, dancing pandas - so many things! Luckily the park was open until 7.30pm so we had plenty of time to see all the lanterns. There was even a small market selling lots of Chinese gifts. We bought a penguin hat for Elliot....not strictly Chinese but he looked very cute! Before we left we had time to try out the yummy looking spring rolls from the Chinese food stall and Elliot tucked into a turkey and stuffing roll....all that waking around had made us hungry! We finally managed to drag ourselves away from the park as they were closing and we'd had such brilliant day - topped off nicely by seeing all the lanterns from afar as we drove back up the exit road. I can thoroughly recommend seeing the Festival of Lights and I urge you all to visit before they close on the 4th January!